Olympic gold medallist Christine Ohuruogu says she will continue top level athletics and is targeting next year's World Championships in Moscow. But Ohuruogu, 28, who added Olympic silver this summer to her Beijing gold, will not commit to Rio 2016. "For me to retire, I'd have to be bored with what I'm doing - and I'm not," the Great Britain athlete told BBC Sport. "We always look at the championships and Moscow is one that we have pinned down to run next year." Ohuruogu, who won 400m world gold in Osaka in 2007, struggled for form after her triumph in Beijing and was disqualified from the 400m final at last year's World Championships after a false start. However, she produced a blistering finish in the Olympic final on home soil to pip DeeDee Trotter and Amantle Montsho on the line to take silver behind Sanya Richards-Ross. She added: "I still think there's a lot more for me to do and work on as I'm not extremely happy with how I run the 400m. "I want to push on from the ground I made this summer. Me and my coach are changing things a little this season." 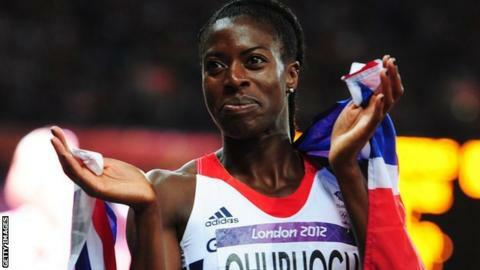 Should Ohuruogu compete in Rio, she will be 32 and it will be her fourth successive Games. "I can't think seriously about competing at Rio," she said. "I don't know what will happen tomorrow let alone in four years. "Everything comes down to fitness, passion for the sport, injuries and whether you'll be competitive - there are a lot of factors. "Of course I'd love to go to Rio but I'm happy with what I have done in my career so far. If it does take me to Rio, that will be brilliant."